Once upon a time, a long, long time ago, there was a little town nestled in the Coastal Range Mountains called Alta Lake BC. The town was home to a diverse group of hippies, rednecks, and other assorted characters who collectively called themselves locals. These locals loved to ski and they knew they lived the best ski town in the world. The town existed only to give the locals a place to eat and sleep when they weren’t skiing. The mountain had been developed specially for them. Every now and then someone from out of town would show up to pay money to ski but they were generally discouraged. These annoying visitors were known to the locals as turkeys. It wasn’t good to be a turkey in Alta Lake BC. They lived on L’Apres pizza and Peterburgers, wore clothing made by T Shirt Al, went to Cosmic Fred’s movie nights every Sunday evening, and they skied. And skied. They hung out at Peak Corner with Rox , Bino, So and Swilly or in one of the blowbooths with Rabbit and Longbranch Mike and skied some more. They discussed philosophy with Bosco at Chateau Ghetto and watched Peter Helicopter do prairie chickens and then skied some more. Locals could always be recognized by the special sunglasses, Vuarnet #4002H that they all wore almost all the time. Those sunglasses served as a form of identification – they let everyone know the wearer belonged to the tribe. In Alta Lake BC there used to be a sign at the top of GS (a run off a lift called the Blue Chair) that proclaimed “CAUTION! Fast Skiing Area, Long Skis Only!” This was strictly enforced. Locals liked to ski fast. Skiing Don’t Miss under a full moon was popular with some. Locals loved to party and they did so at every opportunity. Regular everyday parties were augmented by special parties – Fast Eddie’s Freakers Ball, the Toad Hall Boogie, the Mogulbash celebration, the pool party at the Christiana with the B-Sides rocking it out, Halloween night at the Mt Whistler Lodge, Doug and the Slugs at the old Keg, to name but a few of the highlights of what was always a busy social season. There were some good restaurants scattered about the little town too – L’Apres, Beau’s, and Rudy’s to name a few, and there were some great watering holes including the Mt Whistler Lodge, the Christiana, Le Club, the Moose, JB’s and the Boot. Especially the Boot. The Ski Boot Motel was built in late 1960’s by David and Irene Andrews. It was a motel/hotel with an attached pub and restaurant. Over the years it was also called the Fitzimmons Creek Lodge, the Bavarian Inn, the White Gold Inn, and the Shoestring Lodge, but to locals it was always just the Boot. There was never anything really special about the Boot – it was just a place the locals liked to go to drink beer and swap stories. In the early days there was a bit of a competition on who could make the most interesting entrance. It wasn’t all that unusual to see someone ride a horse into the place. Some remember one evening when a motorcycle was driven into the pub and up to the bar. The biker – quite pleased with his deed – strutted up to one of the five women in the place and tried to strike up a conversation. What he couldn’t see was the bartender filling the helmet he had left on the bar full of draft beer from one of the taps. His cockiness vanished when the bartender came up behind him and in one quick motion lifted the beer filled helmet up and onto the riders head. The poor guy slunk out of the bar soaking wet leaving the locals rolling on the floor. 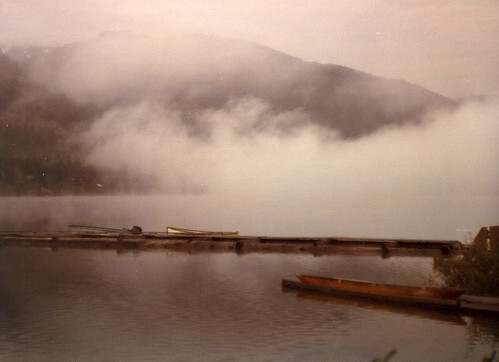 As the years went by Alta Lake BC began to change. It became a resort municipality. The town was renamed More and more people moved in. A ‘Town Center’ was built on a perfectly good garbage dump. A grocery store appeared. The liquor store moved out of a trailer and into a real building. Hotels seemed to breed. The first red light appeared. An adjacent mountain was developed. More people moved in. Cable television appeared. More and more turkeys showed up and discovered what the locals had known all along. The mountain put a chairlift up to the peak which turned the gorgeous alpine into one big bump run. The other mountain was sold to a real estate developer. The original mountain was purchased by the same developer. More lifts went up in the alpine. The Mt Whistler Lodge was given a Viking funeral. The Downhill and Franz’s runs both suffered sacrilegious ‘improvements.’ People stopped leaving their packs hanging from trees outside the Roundhouse. At some point turkeys became ‘guests’. After many years the locals that remained realized that the only thing left of Alta Lake BC was the Boot. Everything else had vanished. Even the Creekside – where it all started – had been paved over and was gone. Diamond Jims’ ski school bell had been returned to Mt Currie. The Skiers Chapel was in a bunch of basements. Dusty the Deadhorse vanished in a puff of smoke. Only the Boot endured. Towards the end the Boot became the towns’ best venue for live music. It was virtually the only alternative to clubbing in the ‘Clown Center’. Punk night at the pub was a sure – fire crowd pleaser. Then there was the Boot Ballet – and let’s just say the dancers weren’t wearing ballet shoes. More than one local lovely, inhibitions diminished by alcohol, woke up after a night at the Ballet wondering if she really did get up on stage and take her clothes off in front of a conflicted boyfriend and an enthusiastic crowd. In 2006 the property developer who owned both mountains sold everything to an American hedge fund headquartered in New York. Coincidentally perhaps on April 26, 2006 the Boot ceased normal operations. In February of the next year the squatters were kicked out and the Boot was torn down to make room for 41 luxury townhouses. Opening price $1.9 million. The locals mourned the loss of the old lady. They also came to realize that, with the demolition of the Boot, there was absolutely nothing left of the place they had moved to all those years ago. Alta Lake BC had vanished as surely as fresh powder on Shale Slope.